About the event : The theme for this event was Loving. Each of the three speakers will respond as they see fit to the theme - with a new piece of literature or an informal talk, an academic lecture or a performance. They might shape or excerpt a previous work for the night or create brand new fiction, non-fiction, theatre or poetry. Their choice of medium is as creatively free as their choice of message. 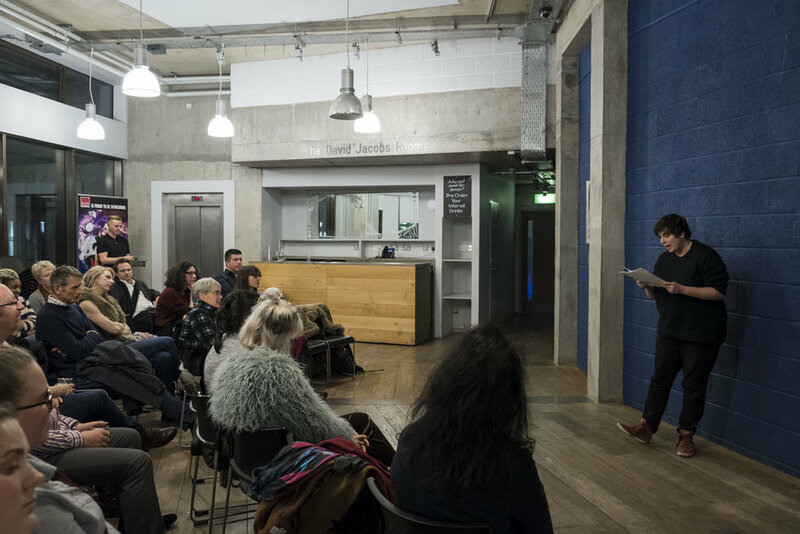 This event was opened with the launch of the 2nd series of new Sampson Low publisher's WCK Pamphlets, producing debut publications for Kingston University students. New works from Olga Kolesnikova, Silje Ree and Yvonne Litschel will be launched on the night. Stephen Barber’s books have been acclaimed as ‘brilliant, profound and provocative’ byThe Times newspaper, and he has been called ‘a writer of real distinction’ and ‘the most dangerous man in Europe’ by The Independent newspaper. The Sunday Times newspaper hailed his books as ‘exhilarating and disquieting’. He has been awarded many grants, awards and prizes for his work, by such international bodies as the Rockefeller Foundation (Bellagio Program), the Henkel Foundation, the Getty Foundation, the Ford Foundation, the Annenberg Foundation, the DAAD Programme, the Leverhulme Trust, the UK Arts and Humanities Research Council, the British Academy, the Japan Foundation, the Saison Foundation, the Daiwa Foundation, the Ford Foundation, and the Mellon Foundation, among many others. Stephen has a PhD from the University of London, and has worked as a professor and arts researcher at universities and arts institutes in many countries, such as the California Institute of the Arts in Los Angeles, the Berlin University of the Arts, the IMEC Institute in Paris, and the University of Tokyo. From October 2012 to September 2015, he was an Invited Fellow at the Berlin Free University’s Performance Cultures Research Centre He is now a Professor at the Kingston School of Art, Kingston University, London. He has published twenty-five books (twenty non-fiction books and five fiction books and two new fiction books are forthcoming in 2018: White Noise Ballrooms and Thatcher's Tomb. He is currently working on a book about the films of the Japanese artist, Tatsumi Hijikata. Marina Lambrou is Associate Professor in English Language and Linguistics. Her teaching, research and publication specialisms are in: narratology with a focus on personal and trauma narratives; literary and non-literary stylistics; media discourses; and teaching pedagogy. Her publications include: 'Contemporary Stylistics' (2007), 'Language and Media' (2009), 'Narrative Text and Time: telling the same story twice (2014) and edited the 'Narrative Special Issue’ of the Journal of Language and Literature. (2014). She is currently working on a monograph entitled 'Disnarration and the Unmentioned in Fact and Fiction'. Marina is also an accredited Life Coach.